During this winter of 2013-2014, we have been working hard to develop our Province-wide newsletter and magazine, entitled Custos. 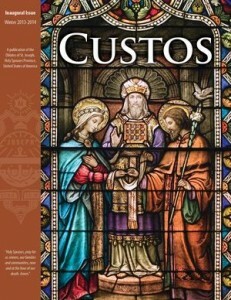 If you are a registered parishioner of an Oblate parish, or if you previously received the Guardian of the Redeemer or JOSEPH magazines, then you have likely also received your very own copy of Custos magazine in the mail. But we also realize the importance of making our content available electronically, so we are pleased to announce that we will also be releasing digital copies of Custos magazine through our Province website here at osjusa.org as well. To see our first inaugural issue, click here!